Now that’s a good dose of nature therapy. We just spent a few days on the west side of the state at a Michigan Audubon event called “Cerulean Warbler Weekend” (CWW). It’s an annual festival celebrating this beautiful (and declining) warbler species. In contrast to the very big festival we’ve been attending in Ohio every May, CWW was small and intimate. 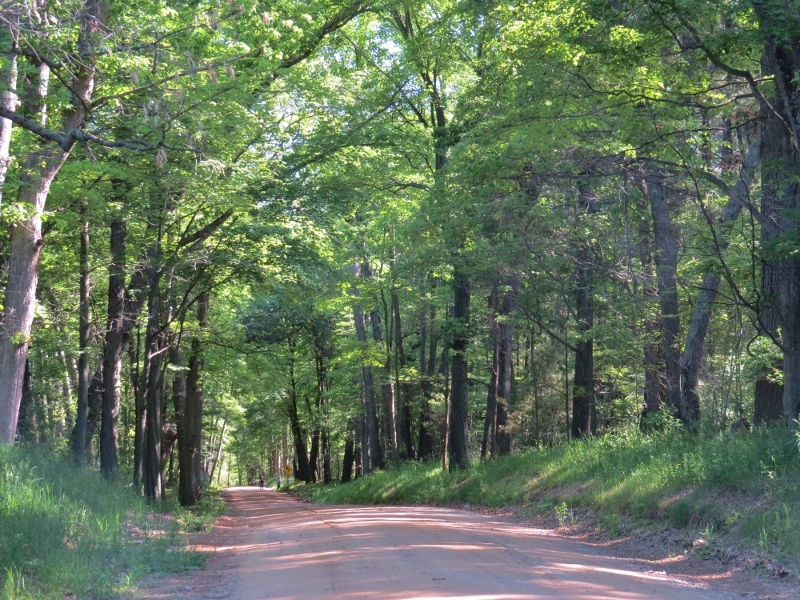 We liked it very much — the people were friendly, the scenery was idyllic, and the birding was rewarding. The event was based at Michigan Audubon’s Otis Farm Bird Sanctuary, just outside of the small town of Hastings. 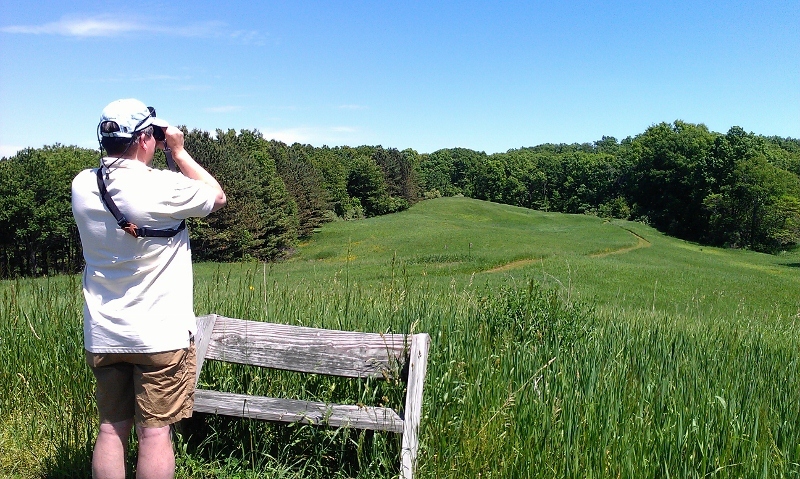 One of our hikes was a tour around the sanctuary with the resident manager, Tom Funke. Tom’s passion for this property was evident as he explained how and why he had used specific management techniques in certain parts of the sanctuary to tweak the habitat for wildlife. He knew every type of tree, grass, and wildflower we saw, and patiently answered lots of questions from the enthusiastic birders on our hike. I was very impressed with him and the entire Otis Sanctuary. 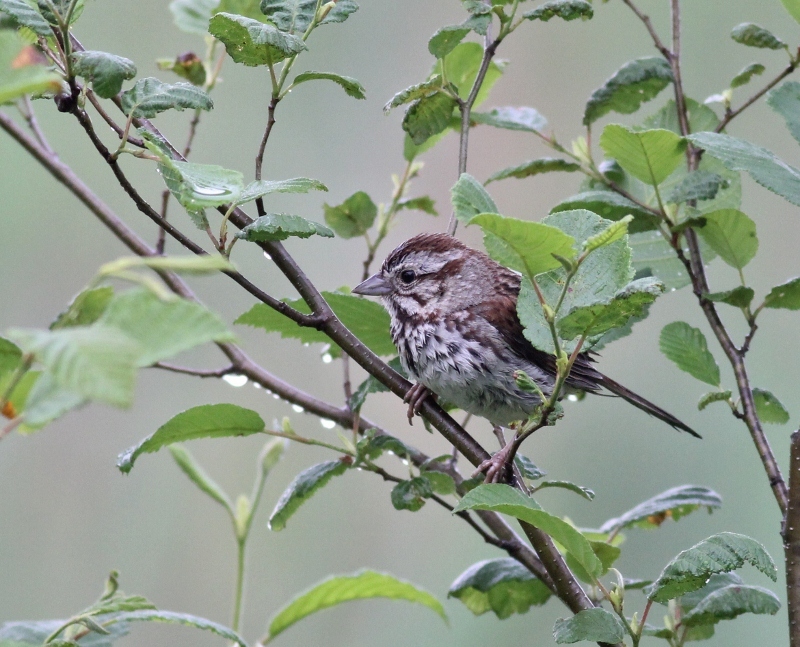 We also went on carpooling and bus field trips around Barry County, searching for warblers, flycatchers, and sparrows, among many other species. We had the extreme pleasure of being led by naturalist Greg Nelson on two of the trips. He took great pains to make sure everyone in the group got to see the birds they were most interested in, and it was clear that he knew this area and its birds very well. He had a very effective technique for teaching us to recognize the calls and songs of the various birds when the woods were just an overwhelming chorus of so many species at once. He’d have us stand quietly listening, and when he heard the target bird’s song, he’d raise his finger up in the air so we’d know that was the one we were trying to see. I really liked that method. Often on these group bird outings there are so many people talking to each other that it’s hard to hear the birds, so I appreciated those times when he asked everyone to stand quietly and listen together. Thanks to Greg’s skill and knowledge, I added Acadian and Alder Flycatchers to my life list, as well as Yellow-throated Vireo. We saw Dickcissels, which I thought were new birds for me too, but when I got home and checked my list I saw they were already on it. Then I remembered that I’d added them when I heard them singing last year in a field near home. But since I’d never laid eyes on one of them, I’d considered them a “BVD bird” — better view desired. And I certainly got my “better view” of them this time, although my pictures don’t seem that great. I had perfect views of two singing Dickcissels through Greg’s spotting scope, on a roadside somewhere in Barry County. The keynote speaker at this event was Katie Fallon, author of “Cerulean Blues: A Personal Search for a Vanishing Songbird.” I got a chance to chat with Katie before her first talk on Friday and asked her to sign my copy of her book, which she graciously did. Although I had almost finished reading her book, I still enjoyed hearing her talk about the problems being caused for this tiny warbler by the mountaintop mining practices in West Virginia and the rest of Appalachia. The bird isn’t officially listed as “endangered” yet, but it may well be on the path to that sad status very soon if we can’t find ways to re-create suitable habitat for it. I was thrilled when Katie joined our field trip the next morning to look for Ceruleans around Barry County. We carpooled to several locations and found the birds singing easily, but were unable to see them. These small birds spend their time at the very tops of the tree canopy, frustrating birders everywhere. But on our last stop of the morning, after explaining why it’s important not to overuse playback, Greg allowed someone to play the Cerulean song from their bird app. I was glad that he refrained from using playback of songs for most of the morning, trying to get us a view without disturbing the birds. But when he finally relented and agreed to do it once, that was the magic trick — the singing male suddenly zipped back and forth across the road over our heads, coming down a little bit lower in the trees to investigate the song of a “competing male.” I think the bird was still at least 30 feet above us when I snapped these photos. Thanks to Greg and Katie’s combined efforts, I got this life warbler that had eluded me for years. I think it was a life bird for several other people on the trip because I had lots of requests for copies of my pics. To make things simpler, I told them I would put the pics here on the blog so they could download them for their own memories of this exciting sighting. The easiest way to know it’s a Cerulean: that black necklace. And something very inspiring happened while we were looking at the Dickcissels along that dusty road. Often when you’re in a rural location, you’ll be approached by passing motorists wanting to know what you’re all looking at. As we were lined up to the side of the road with several spotting scopes on tripods and a bunch of people with binoculars looking out into a seemingly empty field, a man in a pickup truck pulled up alongside and asked what we were doing. And this is where the enthusiasm of my fellow birders always delights me: You’d think we were small children, the way we all crowded around his truck excitedly telling him the name of the bird and encouraging him to get out and take a look at it. Even men in their 60s and 70s were urging him to come take a look. And wouldn’t you know, he was interested and got out of his truck to take a look through the spotting scope. He stepped back and asked the name of the bird again. Dickcissel? Yep. He looked again and looked up with a huge smile on his face and said something like, “Well, I’ll be darned.” And then one of the birders stepped up to him to show him the photo of the bird in a field guide. He spent another minute or two chatting with us about where we were all from and then another vehicle came along and he had to move his truck. But he thanked us and drove off smiling in wonderment that a beautiful bird like that was right here, in a field he usually didn’t even glance at. And that, my friends, is how you start winning people over to Team Conservation. It’s all about the sharing — sharing the beauty of these birds and their songs, sharing our enthusiasm and love for them, and sharing the knowledge of how humans can unwittingly hurt their chances of survival. Once people have an awareness of the amazing birds that live among us, I think they’ll be more likely to help protect them. At least that’s how it happened to me. 🙂 Enjoy a few more pictures from this peaceful and educational weekend, below. This entry was posted in Birds, Ecotherapy, Threats to Birds and tagged Barry County, birdwatching, Cerulean Warbler, Michigan, Michigan Audubon. Bookmark the permalink. Kim I really enjoyed this post and especially the man tha got out of his truck to take a look. Your photos are so beautiful and refreshing and the hawk is something special to look at. thanks for making my day a bit more special. Lovely photos, Kim. The canopy of leaves back-lit by the sun above the Warbler and Cerulean made those photos simply stunning to my eyes. What a great weekend you and Eric had! I love when you show us photos of the area, other birders, and of course all sorts of wildlife! I know we have various warblers here in Oklahoma but I haven’t spotted one yet. I suppose I will have to satisfy my warbler fascination by admiring your beautiful photographs! 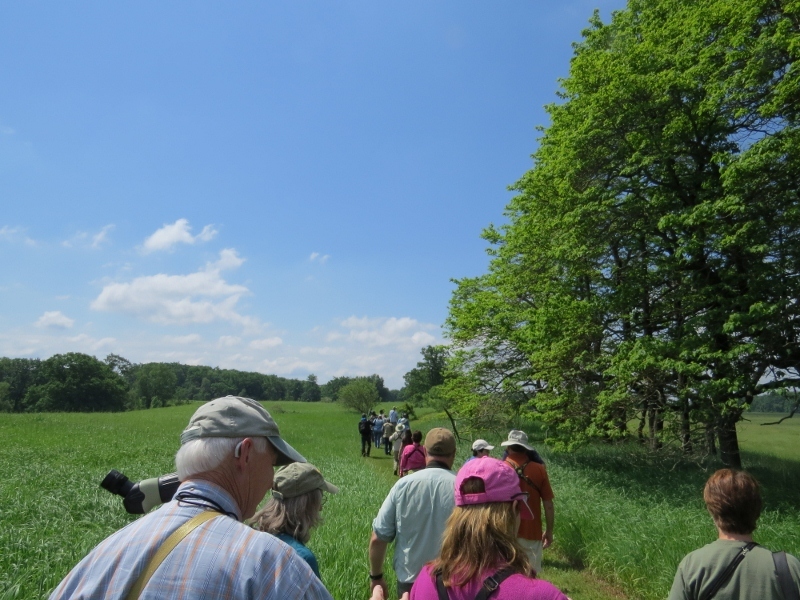 What is your next birding event? I’m really enjoying these updates! I just went on an evening bird walk with my Audubon group tonight, but things will probably be slow for a while now. But we’re going to a birding lodge in Panama later this summer — very excited about that! Gorgeous pictures! Looks like Michigan is in full bloom. Yes Lauren, it’s gorgeous here right now! This was my second year of attending the Cerulean Warbler Festival. Although I have yet to spot the elusive Cerulean, it is such an enjoyable location to bird. A treat for me were the Common Loons and their two babies riding on the parent’s back. I also was able to identify the beautiful song of the Wood Thrush which Greg pointed out to us, which I was then able to recognize last night on a walk through the woods in Holland, MI. It was nice to meet you, Kim, at breakfast Sunday. Hopefully, we can cross paths again on other birding trips. I was happy to meet you too, Gail. I love getting to know my blog subscribers in person! What a wonderful place. I enjoyed reading your post. Lovely post! It sounds like such a fun and rewarding trip. Oh Carol, thanks, it was really a great experience. I’ve just realized a different side of Kim Smith, than the one that I knew from before. Having met her earlier at the Stony Creek Nature Center, and shared a nice initial chat session, she has now captured my birding and wildlife loving soul. This post, most beautifully written, will be long remembered by her newest admirer. We will meet again, at our favorite parks and birding destinies, but you will be a different person in this old boy’s eyes. I’m pleased to know you Kim, and call you a friend. Wow, what a nice thing to say, Rob. Thank you. Great report and beautiful photos, Kim! You made me wish I had been there — especially to see the Dickcissel, which I love and haven’t seen in several years. Thanks for getting my day off to a good start with this wonderful post!